Getting to and around Wessex that is the beautiful south west English counties of Devon, Dorset, Hampshire, < a> Somerset and Wiltshire is reasonably easy. Transport access by plane, boat and train, coach and car is a peach. © Copyright Hywel Williams and licensed for reuse under this Creative Commons Licence. For those visitors coming from abroad by plane we hope you have an enjoyable holiday. 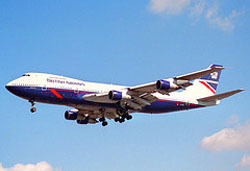 There are four airports within Wessex and two in London which are within easy reach. All are international. All have good facilities and access to road and rail is made as simple as possible making getting to and around Wessex an easy matter. The major roads can of course be busy in the summer - there are always the less major roads and the country roads to explore! 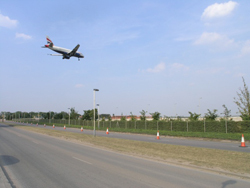 The major airport in Britain is Heathrow International Airport. Details can be found in the link in the heading of this paragraph. It is one of the largest and busiest airports in the world and is situated only about sixty miles from Wessex. Planes come and go to every part of the globe. is a smaller airport than Heathrow and caters for services to and from Europe. There are two Terminals, North and South. Good access. Details can be found in the heading of this paragraph. There are four international airports in Wessex situated very helpfully in various parts of Wessex. Bristol Airport is the largest. Southampton is a large port city on the south coast of Hampshire that caters for air services from many parts of Europe. Being in Hampshire the airport is already in Wessex and there is road and rail access to all parts of the region. Click the link above for details of the airport. An up and coming airport is Bournemouth. Caters for traffic to and from a large number of places all over Europe and the Mediterranean. Situated on the south coast in Dorset it is ideal as an entry point for all of Wessex. Bournemouth itself is a lovely location for a seaside break. There is a shuttle service between the Traffic Interchange and the airport to access rail and coach transport. Click the link above for details of this fast growing airport. Handles flights from all over the world. Bristol is more or less geographically in Somerset and so in Wessex. It is a large busy port city with all those advantages of access and accommodation. Bath is close by and Devon not far away. Click the link above for details of the airport. Situated near Exeter the county town of Devon, the airport caters for traffic to and from Canada, many places in Europe plus other places as well. Ideal for those wishing to visit Plymouth the cultural centre of Devon and the place from which both the Pilgrim Fathers sailed to America and the First Fleet sailed to Australia. Click the link above for details of the airport.. Welcome too to our friends who are coming into the country as visitors from our European neighbours. 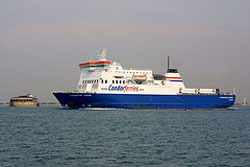 The easiest way to get from Europe to Wessex is by one of the Channel ferries. They take the car, all your baggage and passengers! Even take your bike. Foot passengers are welcome. Some are night ferries and cabins are available. Quite comfortable if perhaps a little small. Railway sleeper cabins are about the same size. Large and comfortable seating areas throughout the ship. Some seats are bookable. There are good restaurants, bars and cafes. Makes for quite a pleasant trip of about six to eight hours from France. Part of the holiday! The best entry port for most ferries into Wessex is Portsmouth where ferries can be found from Le Havre, Caen, Cherbourg and St Malo in France and from Bilbao and Santander in Spain. From Jersey and Guernsey in the Channel Islands also. National Express coaches call right into the Continental Ferry Port in Portsmouth. From Portsmouth all of Wessex is at your feet. The nearest ferry port to Paris is France's second largest port, Le Havre, which has three ferries a day to Portsmouth run by P & O. They also run a service from Caen. 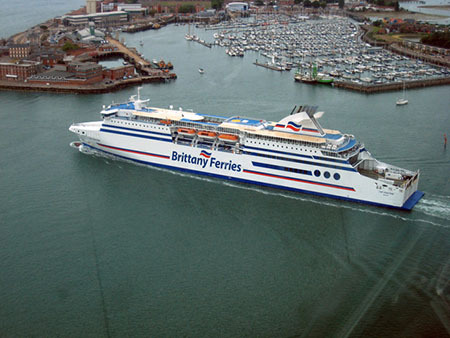 Brittany Ferries operate into Portsmouth from Caen, Cherbourg and St Malo in France and Santander in Spain. Plymouth is another entry port into Wessex. It is Devon's largest city. Although not the county town it is the cultural capital of the county. Famous as the port from which the Pilgrim Fathers left and also the First Fleet to Australia. Brittany Ferries run ferries from Roscoff. Why not try Eurostar. 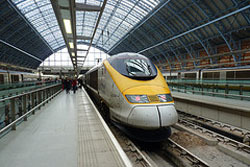 From Brussels and Paris to St Pancras, London. Underground trains from there to all other major stations in London. From there to any part of Wessex you fancy. Trainline. is the best way to find times and get tickets through Europe and across the UK. Much cheaper! Access to Wessex by rail is easy enough from most parts of the country. Rail Maps can be found here. With careful planning there may be no need to go through London unless you wish to – or it is cheaper! Birmingham makes a good jumping off point from the north. From the south east coast Portsmouth and Southampton make good aiming points. Bristol is easily accessible from Wales. For fares and timetables please click here There is a journey planner. It is possible you may find a Rail Card useful. They may cut as much as a third off the fare. Bikes are carried free on the railway but there are conditions Remember though if you are going further and need to access other public transport the bike may have to be paid for, if it is allowed on. It is best to check with the public transport company concerned. Trainline. gives everything you need to get around UK's rail network, even cheaper tickets!! 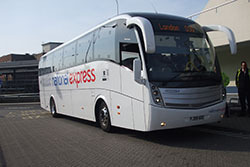 National Express coaches operate all over the country and have frequent timetables and extra services throughout the summer. Airport Express coaches connect many airports. All the National Express services save the hassle of the drive and no car park charges at the end! Bikes can be carried but they must be of the folding type as can light manual wheelchairs. Did you realise that travelling by coach instead of the car is seriously environmentally friendly? For instance a journey from London to Bristol is about 117 miles and saves about 35 lbs of CO2 per person! That is 141 lbs for a carload of four people! Very friendly! The route by road of course depends on where the journey starts! A touring holiday of Wessex would benefit from a good printed map, or better still one of those handy satellite navigation systems. Major roads on the whole are good but can get crowded in the summer months. Planning the journey saves time and arguments! Starting in the early morning and planning to get through bottlenecks or towns before the rush hour can save time and frustration. Plan to take breaks in interesting places every two hours or less on a long trip. The journey is part of the holiday after all. Change drivers if possible. Enjoy the trip. is the major route out of London as far as Basingstoke. Why not! Travel through some interesting places, take your time. Sustrans have some brilliant cycling routes through beautiful countryside. Some routes are off road. For some ideas on cycling in Wessex why not try our Cycling in Wessex and Cycling in Southwest England pages. For those who like hiking there are many ideas on the Walking Trails pages. Available from all airports and from many centres throughout Wessex. Wessex welcomes you all, enjoy your holiday and come back again.